Big Almaty Lake, located at an altitude of 2511 m, on the upper side of the canyon by the same name, is fed by the Almaty River running through it, and is part of a wonderful national park. Big Almaty Lake is set high up in a gorge of the Bolshaya Almatinka River, 2,511m above sea level and 28.5km south of Almaty. It lies in a hollow like a gleaming mirror, surrounded on all sides by majestic peaks. Three main peaks tower above the lake and can be seen from the northern end of the dam: Sovetov (4,317 m) to the southeast, Ozyorny (4,110 m) to the south, further up the river valley, and the forested slopes of Turist (3,954 m) to the southwest. Turist is the crest of Bolshoi Almaty Peak, a 3,681 m high pyramid, which is visible from the city center. Fed by glacial water, the lake is 1.6 km long, almost a kilometer wide and 40 m deep. Higher up above the pale blue chalice of the lake is the domed Tien-Shan Astronomical Observatory, in a very ancient glacial valley 2 km from the lake and at an altitude of 2,700 m. Walk another 8 km and you will reach the Cosmic Ray Research Station at 3,300 m, near the Zhosylkezen pass. A 23 km drive leads there from the city of Almaty. As far as the hydroelectric power station you will be driving on asphalt, and the last stretch is a dirt and gravel track into the Alatau - Eliy National park, which charges a small entrance fee. The lake's high altitude location keeps it cool, and so, even in July, the water temperature does not exceed 8 degrees. However, this does not stop winter swimmers, the loyal "ivanovezchs", and even draws visitors from afar who would not miss a chance to harden their bodies by plunging into these pure icy waters and being revived. The canyon itself is considered to be extremely dangerous to climb in due to mudslides, and it is to the credit of Almaty mudslide specialists that the lake has survived to this day. The Big Almaty Gorge is one of the most noteworthy, accessible and frequently visited places. An asphalt road runs from the city to the Gorge for the first seven kilometers on a slight incline, with gardens and modern cottages to the right and left dotting the region, among which the "Orbit" television antenna picturesquely blends in, receiving programs from the Earth's artificial satellites. The Almaty Sanatorium was established among gardens, poplars and the magnificent park behind it at a height of 1,070 m, 3 km from the city suburbs. The road becomes steeper at the sixth kilometer from the city suburbs, and the asphalt road diverges there. The middle road is the longest and will take you to the lake and swampy heights; while the right-hand road will bring you to the Alma-Arasan Sanatorium. A very steep road leads to the Big Almaty Lake; it goes from the river's floodplain up the steep eastern slope. Rocks and scree surround the road. The very cold lake, up to 38 m in depth with crystal-clear glacial turquoise water (during decent weather) sits 38 km from the city center (25 km from the entrance of the Gorge) at 2500 m. The Big Almatinka River runs into it and flows out of it. Completely wild and extraordinary beauty is to be had around the lake: moraines, talus, rock and gentle Tien-Shan firs. There is a pass above the lake on the way to a most beautiful light-blue lake: Issyk-Kul (in Kyrgyzstan). In spite of the steep slopes, many Almaty citizens hike to the lake on foot to breathe the pure mountain air and admire the mountain atmosphere. The Bolshaya Almatinka Gorge is far from the city and therefore is less crowded. 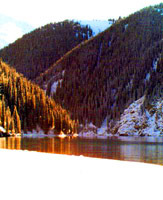 If you happen to visit, be sure to walk up to Big Almaty Lake, situated at a height of 2,510 m (30-40 m deep and 1.6 km wide). Fresh alpine air, the constantly changing color of the lake and a splendid mountain vista attract hundreds of travelers on weekends. There is an astronomical observatory near the lake, with a hotel where you can relax and enjoy watching the stars through a telescope. of OrexCA.com and KTA and KAGIR. Information is taken from the CD "All about tourism in Kazakhstan"